The orderly nature of protein folding was one of the great surprises of the early days of structural biology. As more and more protein structures were solved, structural biologists discovered that there are a finite number of ways that a protein chain can fold into a stable structure. One of the goals of PSI researchers has been to enumerate these possible folds, and to understand how they are morphed through evolution to perform many different cellular tasks. The folding pattern of NTF2 (nuclear transport factor 2) has proven to be a versatile domain fold, being adopted by a variety of quite different sequences and being applied to proteins with many different functions. 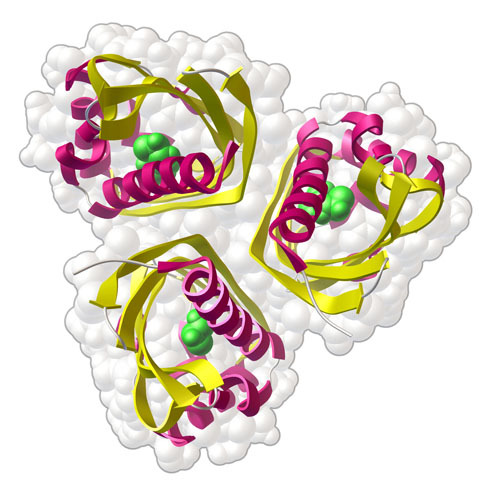 It is composed of a beta sheet (shown here with yellow/green arrows) and several alpha helices (shown in magenta). Often, a pocket is formed between the beta sheet and the layer of helices, forming a convenient location for creating an enzyme active site or a small molecule binding site. This versatile fold was characterized in NTF2, shown here from PDB entry 1oun. NTF2 is important for the transport of molecules into the nucleus through the nuclear pore complex. The large beta sheet in the domain mediates the formation of a dimer in the functional form of the protein. 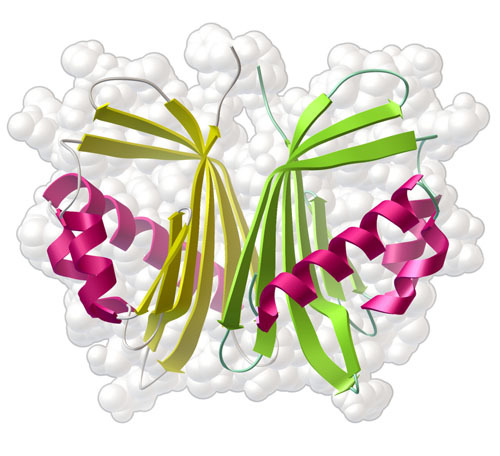 The binding pocket recognizes a key phenylalanine amino acid in its partner, RanGDP. Many proteins with NTF2-like folds are enzymes, using the binding pocket as an active site to catalyze a reaction. The protein shown here, solved by PSI researchers at JCSG and available in PDB entry 3b8l, may be an example of this type of enzyme. It is composed of three symmetrically-arranged subunits, each with its own binding pocket. In the crystal structure, these are filled with glycerol molecules, but based on the structure, PSI researchers have postulated that it acts as an aromatic ring hydrolase. PSI researchers at JCSG have recently solved the structures of three new protein domains with the NTF2 fold, included in PDB entries 3k7c, 3kzt and 4hyz. These were chosen because they were predicted to represent new, diverse sequence families for this domain, with no common sequence motif shared between the three. When the structures were determined, they all showed a fold similar to NTF2, with a beta sheet and several alpha helices. All are thought to be domains that act outside of the cells, to recognize small molecules. To look more closely at these three new structures, the JSmol tab below displays an interactive JSmol. Three structures of NTF2-like domains are overlapped with the structure of NTF2. Use the buttons to change the representation and coloring. The ribbon diagrams are good for looking for similarities in the folding pattern, and you can show the protein atoms to look for pockets that may be functional binding sites. Bullock, T. L., Clarkson, W. D., Kent, H. M. & Stewart, M. The 1.6 angstroms resolution crystal structure of nuclear transport factor 2 (NTF2) J. Mol. Biol. 260, 422-431 (1996). Eberhardt, R. Y., et al. Filling out the structural map of the NTF2-like superfamily. BMC Bioinformatics 14, 327-338 (2013).